I’ve lost over $300,000 worth of bitcoin so far. Now’s the bit where I’m supposed to tell you it’s all fake, and I only lost it in the cryptocurrency trading simulation game Bitcoin Flip. But no, I actually bought $400 worth of bitcoin back when it was cheap, then left it in the hands of the Mt. Gox online exchange, which then lost it. And yet I still recently bought another $210 worth of bitcoin, which has already dropped to $172. This is not investment, this is gambling. I would have done better just playing Bitcoin Flip. Bitcoin Flip is a free game for the web, iOS, and Android. (Google recently kicked it off the Play store, but the creators, a group of Latvian students who previously created the stock-market simulator Trading Game, are working to get it reinstated). In the game you can trade 24 cryptocurrencies such as Bitcoin, Ethereum, Ripple, Monero, and Dogecoin, based on real-life prices pulled from various online exchanges. 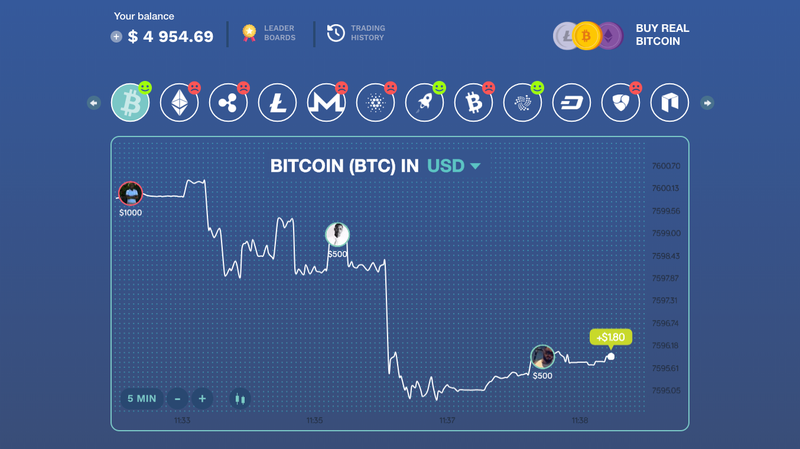 Below the sophisticated price graph for each currency, the game provides a short description and history of that currency, making this a decent educational tool for beginner crypto enthusiasts. Bitcoin Flip plays safer with your pretend money than anyone would with your real money; the game only lets you trade small amounts of your $5,000 pot at a time. But if your playing style at all resembles mine, you will immediately begin losing money anyway. The game has efficiently reminded me that I have no business trading actual crypto, or really any financial instrument more complex than a baseball card. But if you’re pretty good at making a profit in the game, you might decide you want to actually buy some crypto. The game helpfully provides links to crypto exchanges where you can buy real currency and lose real money. (Co-creator Louise Mccauley tells me the game is unassociated with any crypto companies or brands.) So have fun, and if you do manage to turn a profit, kindly never tell me.